Guillain-Barré Syndrome (GBS) is a disorder that causes a patient’s immune system to go haywire and attack the peripheral nervous system. Symptoms begin anywhere from one day to several weeks after a vaccination. However, they usually peak around one to two weeks after the shot is given. Additionally, the chronic version of this disorder is known as Chronic Inflammatory Demyelinating Polyneuropathy, or CIDP. What are the Symptoms of Guillain-Barré Syndrome (GBS)? 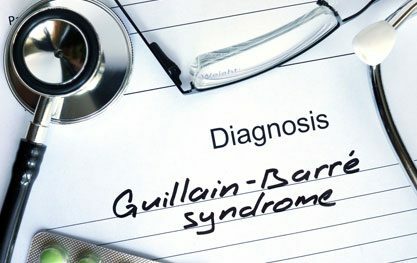 Symptoms of Guillain-Barré Syndrome start out as weakness or tingling in the legs. Sometimes, these sensations then spread to the arms and upper body until the victim becomes paralyzed. In severe cases, GBS causes such severe muscle weakness that patients must be put on a ventilator to breathe. Getting Guillain Barré Syndrome after a flu shot is rare, but it does happen. Researchers who study vaccine reaction rates find that “GBS is more strongly associated with the flu vaccine” compared to any other. The Journal of the American Medical Association cites Guillain Barré as the most frequent neurological condition reported after getting the flu shot. What To Do if You Have GBS from a Vaccine Reaction? Contact a lawyer who is experienced in representing patients in front of the United States Court of Federal Claims. Filing a vaccine injury claim is an extremely complex and litigious process. There are no legal costs for an injured patient represented by MCT Law. At the end of the case, our law firm asks the Court for reimbursement of the fees and costs incurred representing you. This reimbursement is separate from any money you’re awarded by the Court. You never have to share any portion of your money for damages with our law firm. Click on this link to find out more about the legal process of vaccine injury compensation. For more information, please fill out the online vaccine form at the bottom of this page or call our office at (888) 952-5242 to speak directly with someone. Diagnosed with GBS After a Vaccine? Guillain-Barré Syndrome related vaccine cases are some of the most common that our Firm sees. Below is a listing of the more recent decisions of the United States Court of Federal Claims awarding compensation to our clients. Results depend upon a variety of factors unique to each case and do not guarantee or predict a similar result in any future case. Accepted file types: jpg, pdf, png, tiff, gif, xls, txt, doc, rtf. I agree to these Termsby Clicking "Send" Below. If you believe you have a possible vaccine injury claim, our highly experienced team will review your case at NO COST to you. MCT Law has been representing vaccine injury clients for 20 years.